The Chairman of the CC CPRF G. A. Zyuganov and his associates led the festive columns. Among the demonstrators were not only muscovites, but also delegations from many neighboring regions, as well as members of the Communist party of Vietnam, studying in Moscow. The meeting on the Revolution square ended the procession. 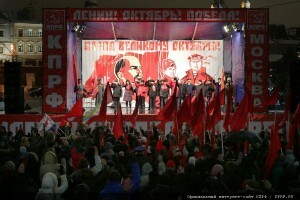 The event took place under the slogans: “New October ahead!”, “Lenin! October! Victory!”. The anthem of the USSR was played at the opening of the meeting. The Secretaries of the Moscow City Committee of the Communist Party V. Rodin and A. Potapov held the meeting. G.A. 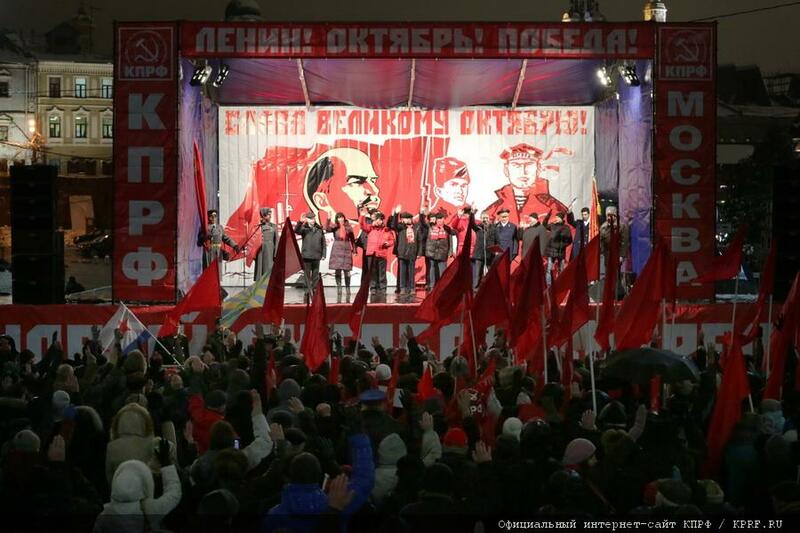 Zyuganov, the leader of CPRF and People’s patriotic forces, was the first to address the participants of the action. In his speech, he mentioned all the successes and victories of the Soviet country achieved under the leadership of Lenin and Stalin since the day of the Great October Revolution till the collapse of the USSR in the 90-ies. Gennady Zyuganov specially mentioned the legendary parade on the 7th November, 1941, when almost 30 thousand of the best sons and daughters of the Soviet country directly from the Red Square went to the front to defend their mother capital. Speaking on International Workers’ Solidarity, the Chairman of the CC CPRF noted that only recently the representatives of the communist and workers’ parties from about 60 countries gathered in the capital of Vietnam, Hanoi, for the 18th International Meeting of Communist and Workers’ Parties. All participants supported the initiative of the Communist Party to hold another 19th meeting next year in the cradle of revolution – Leningrad and Moscow, and also expressed their desire to take part in the celebrations dedicated to the 100th anniversary of the October Revolution. After his speech, G.A. Zyuganov presented the Party and Komsomol membership cards to the newly adopted members of the Communist party and Lenin Komsomol. Gennady Zyuganov also gave commemorative medals of the CC CPRF “75 years of the battle of Moscow” to the veterans and activists of the party.